The roots of John Q. Public, according to Hess and Northrop in Drawn & Quartered: the history of American political cartoons, seem to go back to Frederick Opper’s “Mr. Common People” who was the symbol of the average American and appeared in the Arena in 1905. 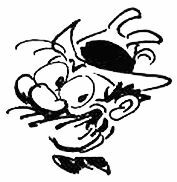 Opper’s character was drawn as a bewildered bald man whose hat was a bit too small and who was subject to the whims of big business’ monopolies and greed. Twenty-five years later as the Great Depression began “John Q. Public” emerged from the pen of Vaughn Shoemaker onto the pages of the Chicago Daily News, where Shoemaker began his career in cartooning in 1922. Shoemaker’s “everyman” influenced fellow editorial cartoonist Jim Lange’s “Mr. Voter,” a similarly-looking glasses-wearing and mustachioed man clad with a fedora. The Oklahoma State Senate eventually adopted Lange’s character as the state’s official editorial cartoon. Shoemaker’s editorial cartoons, including those with John Q. Public can be viewed in the Archives & Special Collections.